I have a big Shapefile with 200,000 polygons but the file is too big for the application that will use it. I would like to generalise these polygons and create much smaller file. I have tried to do this in QGIS using "Simplify Geometries" tool. I have tried this on a very small portion of my Shapefile and I am happy with the results but have small problem which I do not know how to solve. I have appended the image to show the problem. WHITE boundaries are boundaries before simplification. RED boundaries are after simplification. The problem areas are circled with orange colour. As you can see "simplified boundaries" contain some areas that after simplification do not belong to any of the previous polygons. 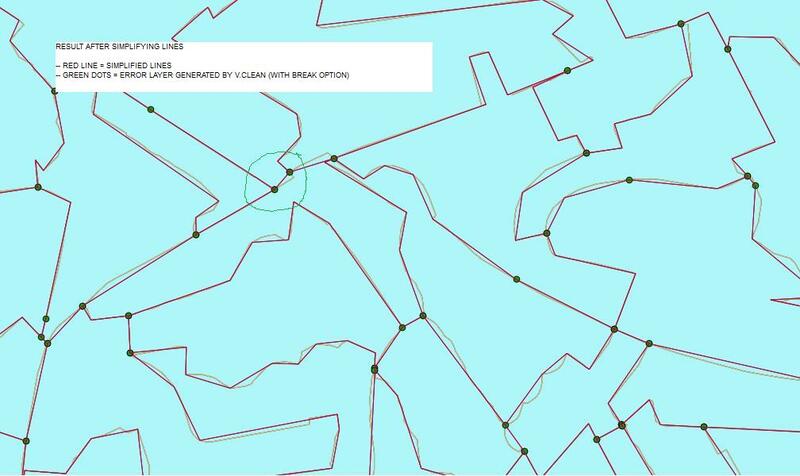 How do I simplify this Shapefile and keep common boundaries between polygons as a single line and eliminate areas that have been created after simplification? I get the following results. It is slightly better than before but still I get areas outside original polygons (see white areas in the picture below). 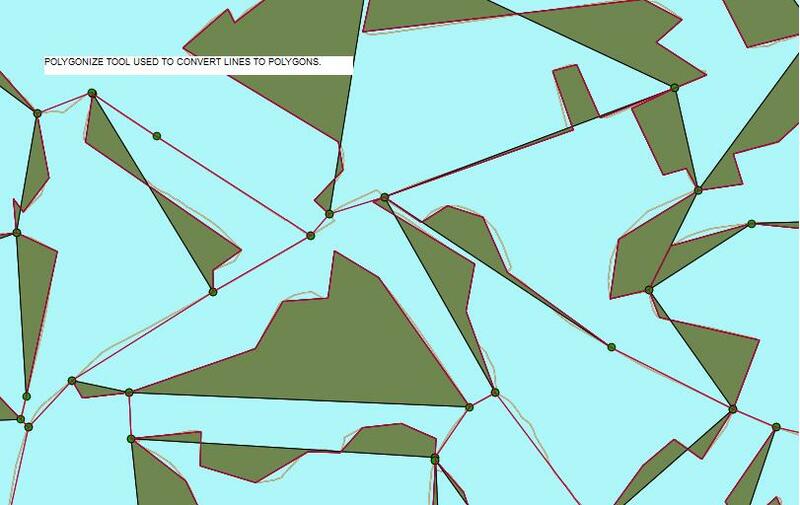 Andrew suggested that I associate each line with adjacent polygon but I do not know how to do it in QGIS. I am sorry to bother you with this issue but I am still trying to complete simplifying polygons process. I have followed instructions suggested in this post and when I thought I got acceptable results one more problem appeared. Below is the summary of what I did with images of results. All steps have been performed using PROCESSING toolbox in QGIS. Second, I cleaned lines using v.clean with break option. This resulted in CLEANED VECTOR LAYER and ERROR LAYER. Error Layer (green dots on the provided image) has green dot on every line intersection. I do not know what this means. Any input on the error layer would be appreciated. Third, I simplified lines using "SIMPLIFY GEOMETRY" tool (result in red lines in the images). Comparing simplified red lines and original orange lines I am happy with the result. Fourth, I wanted to convert lines back to polygons using "Polygonize" tool in "PROCESSING" and got results that I did not expect (second image with a shaded dark olive colour polygons). It looks like polygonizer connected error layer intersections and created completely different set of polygons ignoring simplified lines. Could someone explain what went wrong here? Why red simplified lines were not converted properly to simplified polygons? As you can see I am not an GIS expert but need to do this myself. I do not know if I am too far from the solution but it is frustrating that I can see simplified lines that I found acceptable for what I'd like to do but cannot convert them to polygons. I got into that problem with Qgis2.16, but couldn't get GRASS to give a topologically correct result like @AndreJ. A nice workaround is to change the v.in.ogr snap tolerance in the advanced parameters of the v.generalize.simplify tool. The default is -1, which prevents snapping in GRASS. By putting a small value here (like 1e-05 m), snapping is enabled and GRASS recognises the shared borders of the polygons. The simplification then gives a topologically correct layer, without holes. Note : By setting the snap tolerance to higher values, it is even possible to alter the polygons so that very thin ones can be deleted if you want. Follow that operation with v.clean using rmarea and a threshold big enough to delete the small leftovers, and there you're done! Note: the only constraint is that the common field has to be ID in Join attributes table, because is the only field of the output of Lines to polygons. That's why the common field is not a variable input of the model. So an ID field has to be available in the input polygon layer. Generating polygons with shared boundaries using QGIS? 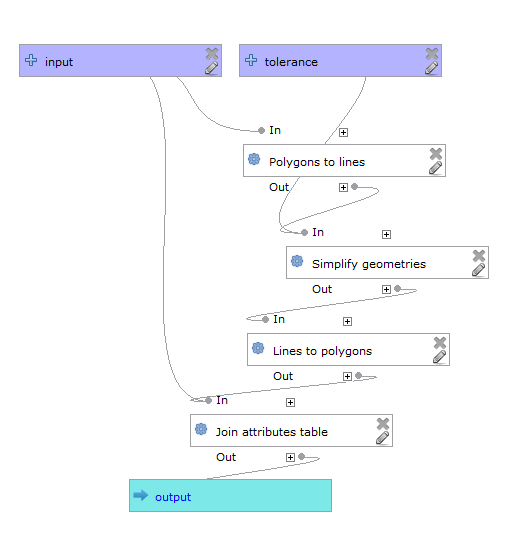 How to generalize shape with PyQGIS without much Distortion in the shape?